The Great Facebook Experiment II is in its waning days. Readers recall that I gave Facebook and its participants a long try from 2010 to 2012 and gave up on it. I found the experience very unsatisfying. Recently I restarted my Facebook presence, mostly in an effort to stimulate interest in richardbarron.net, but also to see if things on the Great Blue Wall were any better than before. I have to say that no, Facebook isn’t any better than it was three years ago. The biggest reason Facebook is popular in the first place is that it gives Everyman a web presence, while at the same time preventing him from ruining it with his terrible taste and lack of creative talent (vis-à-vis MySpace in 2006). Taste and talent are also the reason Facebook is not the place for greatness. We’ll start with something I found on the web (so I am pinching it under “fair use”). I am not making this up. People actually think this is miraculous. People, LOTS of people, look at this image and fail in every way to understand what’s really going on. That gives me chills all over!!!! Lord trying to say get ready to do his work here in Eureka Springs AR. Wow that is great! How exciting! Things are fixing to change!!!!!! We were just talking about this today. Planning to come see it real soon. I think everyone needs to share this. Let’s let this go viral!!! I just got chills. Amazing. Amazing!!!! Wow that is awesome. I work at the play and enjoy every moment of it. I wasn’t on set for this part but that is truly amazing. This is wonderful! What a beautiful sight, I wish I was there to see that! I have a pic of myself with several other Ladies with me, and there is an angel covering hovering over us. When I asked the Lord about it when I picked the pics up at Walgreens. He told me it was my guardian angel! I was brought to tears and awe! Pretty neat. I shared your post. That’s amazing and so wonderful!! GLORY BUMPS FROM HEAD TO TOE!! Even the real GOD loves the Great Passion Play. You should come see it for yourself. You never know you might just see the real GOD there. I know you will feel HIS Spirit there. But wait is that satin in the lower corner of the picture?? Amazing I wish I had been there. Look! 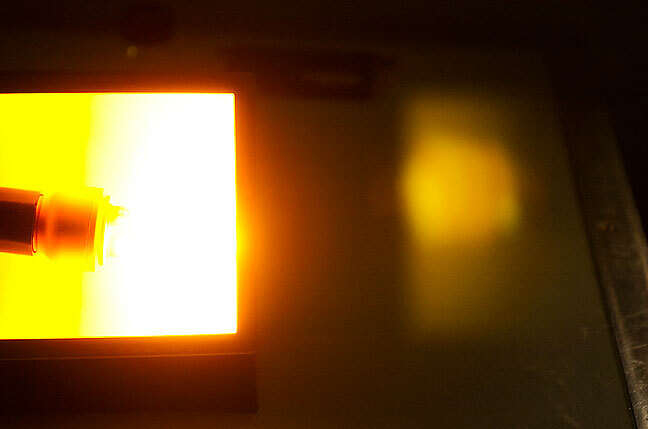 A ghostly image appeared near a very bright compact fluorescent bulb! It must be a miracle! Praise Bulb! Christians, it makes you look so ignorant and silly when you believe and assert that simple optics is, “amazing and so real!” This isn’t a sophisticated extract of the possible nature of the Universe. It’s a bunch of hillbillies who think a cell phone camera captured a miracle. They are the overwhelming resonant voice of the faith. Another thing that seems to be directly related to my being on Facebook (both then and now) is an uptick in intolerant Christian rhetoric toward me personally, so far exclusively anonymous. I think I see it when I am on Facebook because friends of friends click through to check me out. I shouldn’t be surprised by this, since intolerance, ignorance, and willful stupidity are ugly, inbred siblings who have nothing creative to contribute, so of course their only contact with my web site and its opinions is the lowest common web denominator, Facebook. Sometimes when I get these letters and comments, I think that they are so obvious and inadequate that they must be some kind of false flag arguing in the other direction. Nobody, not even the hyper-religious, I rationalize, can be this stupid. Do Christians think that hating me will change me? Do they think hating gays will make them straight, or hating Muslims will end terrorism? Do the Christians who commented on that photo think I will change my wicked ways when I see its testimony? That anyone will? Answer me this: if god is real, why do you have to argue for it? Why would you even need to teach your children about god, for if god is real, would he not be completely self-evident? Why do you think there are so many re-inventions of church? H20? Turning Point? Crosspointe? New Horizon? Because the Baptist Church and the Church of Christ and the Catholic Church, despite their claims to the unerring truth about god, can no longer deliver. God needs to be updated. God needs a makeover. No, really. The absolute truth is rewritten, then rewritten again, updated and upgraded to a new, modern, popular god, throughout history. And then. Oh, this one is just. Ugh. Some of my friends do this: they cite “math” as proof of god, while obviously, demonstrable not using math. Educated people. People I like and trust. When is math not math? Do I really have to explain this? The chiron in the video says “101%: from a strictly mathematical viewpoint; what equals 100%?”, follow immediately by, “What does it mean to give more than 100%.” This is the quintessential dodge of the faithful: ask a question that seems like it represents logic or science, followed by answering it without using any logic or science at all. “Therefore, one can conclude with mathematical certainty that: …” Of course, this conclusion is just silly. Silly. You can’t conclude that the actions of a deity have an effect based on cherry-picking some words and matching their letters with numbers. It’s embarrassing when you say things like this. So, anyway, I got an unsigned letter from a Christian. From my chair, any unsigned letter just looks like stalking. And for what it’s worth, when you send an unsigned letter, I can cherry pick and quote mine all I want. As a blogger and reader of blogs, I was thrilled to ﬁnd the “photographer of my youth” at richardbarron.net. I began reading, observing, watching, and viewing. Then, I was saddened. I suppose in Oklahoma, we assume the friendly neighborhood photographer is a believer in God, a believer in Jesus’ death and resurrection, and heaven-bound like “the rest of us.” After all, it is Ada, America. Lesson Learned. “The rest of us” is thrown in there as part of the “appeal to popularity” logical fallacy. Seeing many of your posts tainted with the opposite of my assumption, I knew what I had to do. After all (again), if someone had good news for me, promises that were true, and a bright future but failed to tell me, well, that would be just plain rude. I’m not rude. But I am skeptical. I’m skeptical to the extent that I sought out God. I researched for myself. I read for myself. I bypassed Sunday School lessons to ﬁgure out on my own what God said, did, promised, was, is, etc. Here’s what I found. The use of the word “research” here is an interesting misnomer. “Research” implies looking at a number of sources for information that can be verified in some kind of an independent, scientific and logical way. Our anonymous author did none of that, of course, though we in the world of logic never find this surprising. God sent his son, Jesus, to die for me. Why? Well, years (and I mean YEARS) ago, people of Israel had to sacriﬁce a lamb for their sins. Pretty brutal. Ugly. Angry. Jesus was the ultimate and ﬁnal “lamb.” And, just to prove that He didn’t just die for our sin, He came back to life so we could LIVE. I devoted another whole blog entry to addressing The Sacrifice of Jesus (link). Let me just add that the Bible never says, “He’s got our back.” That, too, is updating and upgrading god. I’ve no doubt you have a Bible. You’re an educated man, so… here’s a few verses from a former “prove it to me” researcher to you:, 2 Peter 1:4, Jeremiah 29:11, Isaiah 40:29-31, Matthew 11:28-29, Romans 8:37-39, Proverbs 1:33. I love this part, because, as you can see if you look up the Bible verses, none of these items is any kind of proof of anything. I find it odd that in a world of ever-increasing certainty of the nature of the world, theists still seem to cling to the thinnest fallacies, these “believe it because it sounds comforting” ideas. But, if you don’t believe in the Bible, then that does you no good, right? So let me say this. I’ve experienced these promises first hand. I’ve been healed. I’ve seen others healed. I’ve seen marriages saved, jobs restored, diseases cured, joy returned, and the impossible become possible. Not because I go to church (which I do) and not because every day is sunny with Barney singing a theme song. Experience isn’t evidence. Testimony isn’t evidence. Incredulity isn’t evidence. Feelings aren’t evidence. No, it’s because I trust in the God who loved me so much that He went to a lot of trouble to prove it. Actually, it’s quite apparent that god has gone out of his way to hide it, not prove it. I have personally witnessed the failure of prayer: man prays with all his might for his wife, who is trapped in a vehicle after a crash. She died right then. Christians have brilliant rationalizations for when this happens: god’s will, her time, god needed another angel, blah blah. It’s so thin. That’s the punch line, really. No signature. What is this? Ashamed of your beliefs? Afraid of them. Embarrassed by them? Afraid of me? So thus the name of today’s entry. That’s my name at the top of this entry, at the top of every entry. I am Richard R. Barron, and I am not afraid for you to know who I am and what I think. But then I talk to actual people in real life, and am reminded that no, real people actually do think that way. Sigh. As for the unsigned letter you received, I’m fairly impressed, except for the anonymous part. Many atheists get letters worse than these, as you know. The worst part of yours is that it pretends reading the Bible and talking to believers is “research”. I know you didn’t quote the whole thing, but what’s here absolutely fails to threaten you, despise you, or even insult you. So I would count this in the “nice-but-misguided” category. The only thing threatening about this and the infamous “Doc” commenter years ago is the anonymousness. It has kind of a “we’ll be watching you” vibe. You are obviously very angry about receiving this welcoming letter from a caring Christian. But your anger with God doesn’t diminish His love for you. The anger you feel inside is a reflection on your rejection of His love. If you could find it in your heart to look up and let His presence wash over you, you can cease being who you are and become an unthinking follower of the masses. Let that anger go. Just fill in your username and password and sign in with Jesus. Put a check in God’s ‘Like’ box. Put a check in God’s mailbox, too. And start checking all those boxes that you’ve passed by. You ~do~ want to be included in our free emailing list. It’s good to be included in newsletters. Spam is God’s way of saying that you’re loved. He giveth unto us toolbars for our browsers and leads us into donations. The internet is the ultimate proof of God’s love for us. For he has given us Google so we can search for him. And through Facebook we are all connected, nailed to our walls just like Jesus’s feet to His cross. Don’t you think it’s time for you to accept God and send him a tweet? See: https://twitter.com/thetweetofgod. I’m mostly troubled that the letter was unsigned. As a card-carrying (they don’t actually give us cards, though), ardent, loud-and-proud Christian, I’m disappointed and confused by that choice. I’m also let down by the citing of “research” and “evidence”. For myself, I know not to “lean into my own understanding”, and instead rely on faith — which, as (I think Anne Lamott put it), is the opposite of certainty. Lastly, the “miracle-in-the-flashbulb” sorts of things drive me insane. If you’re truly devout, you don’t need Facebookable images and burning bushes — and it’s better in any case to rend your heart, not your garments. 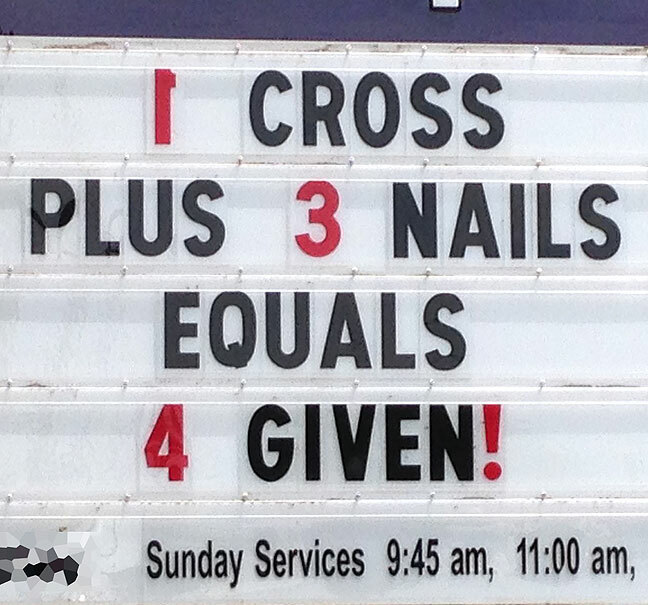 I don’t appreciate it when things like that make Christians appear so…basic and unimaginative. Making judgments about people, being argumentative, rude, condescending, etc., does not serve anyone’s purpose. Even as a Christian, I am often appalled at what I see “Christians” do in the name of Christ. Sometimes I laugh because it is absurd. You have shared a few examples of these efforts. It reminds me of Pastor Jim at OU who shouted at people and called them fornicators when he didn’t even know them. I have countless examples that I have witnessed that are similar. I am far from perfect as you know. I know that I am at my best when I make anyone or anything better. I cannot do that that judging, shouting and belittling. In fact, quite the opposite. I am also concerned by casting people into roles because of experiences with others. This true of folks of all different religious or non-religious perspectives, races, nationalities, genders, sports affiliations and favorite colors. Oh, one more thing. In general, I agree that Facebook is useless. If taken too seriously, it is a total waste. However, it can serve a purpose, such as communication with a large group of people at one time. For work, I have found it very useful. For my personal life, it is a tool to share with folks I don’t get to see very often, if ever. I have been on and off at times as well. I expect NOTHING from Facebook for my personal stuff so I don’t get that disappointed. Yes, there is that. I don’t understand the anonymous part. I think the only thing that could budge me to leave a letter/message/email unsigned is if I wanted to offer encouragement to someone without attaching my name/personality to it.